This post asks some questions about the agency of hierarchical action selection. We assume various pieces of HTM / MPF canon, such as a cortical hierarchy. An agent has agency over a state S, if its actions affect the probability that S occurs. Now let’s consider a hierarchical representation of action-states (actions and states encoded together). Candidate actions can therefore be synonymous with predictions of future states. Let’s assume that actions-states can be selected as objectives anywhere in the hierarchy. More complex actions are represented as combinations or sequences of simpler action-states defined in lower levels of the hierarchy. Let’s say an “abstract” action-state at a high level in the hierarchy is selected. How is the action-state executed? In other words, how is the abstract state made to occur? To exploit the structure of the hierarchy, let’s assume each vertex of the hierarchy re-interprets selected actions. This translates a compound action into its constituent parts. We exclude the possibility that higher levels directly control or subsume all lower levels due to the difficulty and complexity of performing such a task without the benefit of hierarchical problem decomposition. So for example, if h=10 and x=0.9, P(a) = 0.34. We can see that in a hierarchy with a very large number of levels, the probability of executing any top-level strategy will be very small unless each level interprets higher-level objectives faithfully. However, “weak control” may suffice in a very shallow hierarchy. Are abstract actions easy to execute? Introspectively I observe that highly abstract plans are frequently and faithfully executed without difficulty (e.g. it is easy to drive a car to the shops for groceries, something I consider a fairly abstract plan). Given the apparent ease with which I select and execute tasks with rewards delayed by hours, days or months, it seems I have good agency over abstract tasks. According to the thought experiment above, my cortical hierarchy must either be very shallow or higher levels must exert “strong control” over lower levels. Let’s assume the hierarchy is not shallow (it might be, but then that’s a useful conclusion in its own right). Local processes may have greater biological validity because they imply less difficulty/specificity routing relevant signals to the right places. Hopefully the amount of wiring is reduced also. What would a local implementation of a strong control architecture look like? Each vertex of the hierarchy would receive some objective action-state[s] as input. (When no input is received, no output is produced). Each vertex would produce some objective action-states as output, in terms of action-states in the level below. The hierarchical encoding of the world would be undone incrementally by each level. At the lowest level the output action-states would be actual motor control signals. A cascade of incremental re-interpretation would flow from the level of original selection down to levels that process raw data (either as input or output). In each case, local interpretation should only be concerned with maximizing the conditional probability of the selected action-state given the current action-state and instructions passed to the level immediately below. Clearly, the agency of each hierarchy vertex over its output action-states is crucial. The agency of hierarchy levels greater than 0 is dependent on faithful interpretation by lower levels. Other considerations (such as reward associated with output action-states) must be ignored, else the agency of higher hierarchy levels is lost. Connections form between layer 6 of cortex in “higher” regions and layer 6 in “lower” regions, with information travelling from higher (more abstract) regions towards more concrete regions (i.e. a feedback direction). Layer 6 neurons also receive input from other cortex layers in the same region. However, note that the referenced work disputes the validity of assigning directionality, such as “feed-back”, to cortical layers. Pressing on regardless, given some assumptions about cortical hierarchy, we can speculatively wonder whether the layer 6 neurons embody a local optimization process that incrementally translates selected actions into simpler parts, using information from other cortex layers for context. The purpose of cortex layer 6 remains mysterious. However, since cortex layer 5 seems to be the direct driver of motor actions, it may be that layer 6 somehow controls cortex layer 5 in the same or lower regions, perhaps via some negotiation with the Thalamus. Another difficulty for this theory is that cortex layer 5 seems to be more complex than simply the output from layer 6. 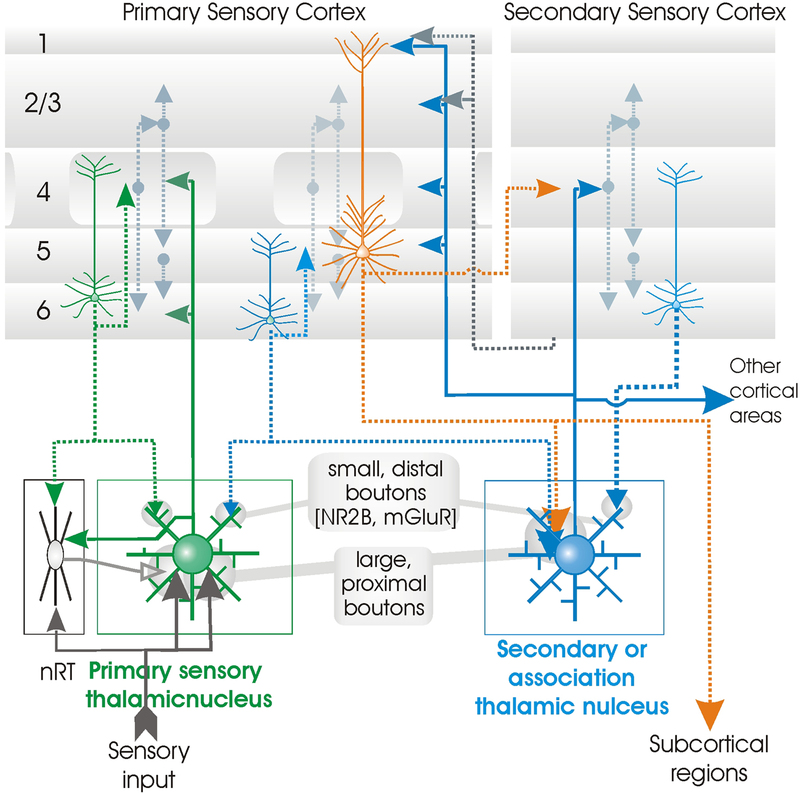 Activity in layer 5 seems to be the result of interaction between cortex and Thalamus. Potentially this interaction could be usefully overriding layer 6 instructions to produce novel action combinations. There is some evidence that dopaminergic neurones in the Striatum are involved in agency learning, but this doesn’t necessarily refute this post, because this process may modulate cortical activity via the Thalamus. Cortex layer 6 may still require some form of optimization to ensure that higher hierarchy levels have agency over future action-states. To conclude: This is all speculation – comments welcome!